The event took place in Kyiv, on November 16 and 17. UHHRU experts spoke in support of ratification of Rome Statute by Ukraine. 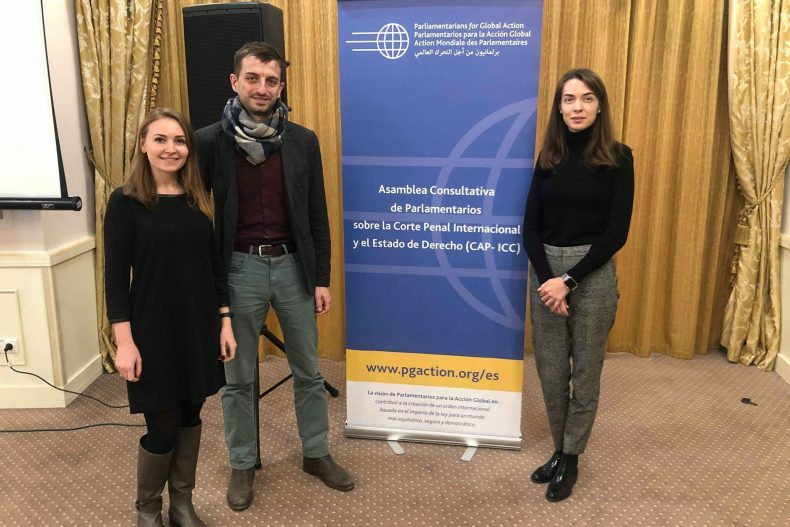 For two days, 40th annual forum of the Parliamentarians for Global Action international network and 10th Consultative Assembly of Parliamentarians for the International Criminal Court and Rule of Law, focused on international justice and rule of law, was conducted in Kyiv. Special attention at the event was devoted to the activities of the International Criminal Court, using its instruments in prevention of the impunity and prosecution for the war crimes, crimes against humanity, and other illegal actions under the international law. Co-organizers of the event were Parliamentarians for Global Action, Ukrainian Parliament, Committee on Human Rights, National Minorities and International Relations, Center for Civil Liberties. Taras Tsymbrivsky, Head of the USAID Human Rights in Action Program, Daria Svyrydova, UHHRU Lawyer and Vitaliya Lebid, lawyer of the UHHRU Strategic Litigation Center participated in the event on behalf of UHHRU. The experts voiced support for the need of ratification by Ukraine of the Statute of International Criminal Court.